Insulin pumps allow greater opportunity to take control of diabetes but, because they are a more expensive option than injections, eligibility criteria exists to ensure the most suitable candidates have access to insulin pump therapy. The most common option for getting an insulin pump in the UK is to have one funded by the NHS. If you buy the pump privately, you will need to consider the total cost, including the consumables, and ensure you have a health team with a specialism in insulin pumps. You will need to arrange whether you will be able to receive care on the NHS or privately before going ahead with buying an insulin pump privately. Insulin pumps tend to cost between £2,000 and £3,000 and the consumables for an insulin pump, including infusion sets, reservoirs and batteries, can cost around £1,000 to £2,000 a year. The NHS does not operate a scheme in which it funds pumps which have been bought privately. The process of getting an insulin pump can vary across different parts of the UK as budgets, the level of demand for pumps and the number of healthcare professionals with experience of insulin pumps can all play a part. The advantage of applying for an insulin pump through the NHS is that you have the chance of getting the pump for free. This for most people outweighs the disadvantages of not knowing whether or when they may qualify for a pump. The process can be as short as a few weeks but it can sometimes take several months or over a year. INPUT, a charity which aims to help people in the UK with gaining access to insulin pump therapy, can provide useful advice and support through the application procedure. It is important, when on an insulin pump, that you have support from a health team that has a strong understanding of insulin pumps. As a result, the NICE guidelines state that insulin pump therapy should only be started by health teams that have a doctor with a specialism in insulin pumps. It is recommended that a dietitian and a diabetes specialist nurse are also present in health teams that are responsible for the care of people on insulin pumps. If your clinic or health team does not have the appropriate personnel, you will need to be transferred to a clinic which does. The NICE guidelines state that under 12s may be suitable for an insulin pump if multiple daily injections are either impractical or inappropriate. It’s important to note that the NICE guidelines also state that between the ages 12 and 18 years old, children will be expected to have a trial of using multiple daily injections (MDIs), if they have not been on MDI previously. If you have good control of your diabetes and want a pump, you may still be able to get approved for a pump but priority may be given to other patients. Using an insulin pump requires significant dedication. You will need to test your blood glucose levels at least 4 times per day and be confident in carbohydrate counting and adjusting insulin doses for different activities. Your health team may also require you to attend a carbohydrate counting structured education course. Moving onto a pump can be a significant change so it’s important that you and your health team have no doubts over your ability to monitor and control your diabetes. If you meet the NICE criteria for getting an insulin pump and your health team is confident you are well suited to going onto Continuous Subcutaneous Insulin Infusion therapy (insulin pump therapy), the next step for your health team is to arrange funding. Your health team will need to write to local health commissioners to agree for funding to be provided. Some people may face more difficulty than others at this stage depending on local health budgets. If your consultant considers insulin pump therapy to be appropriate but funding is refused, get in contact with INPUT. Once funding has been secured, you will have a date arranged to commence training on the use of your insulin pump. Insulin pump training can vary from a single day session to having a trial period, often for a week, with an insulin pump with saline in. Note that if you have trial with saline in the pump, you will need to take insulin injections whilst on the trial. Will the NHS pay for all consumables? 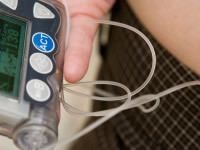 It is common for the NHS to cover the cost of consumables such as infusion sets. If you have a pump with glucose sensors, or a separate continuous glucose monitor, these are not provided on the NHS so you will need to buy these.